By Alexis Leon, Mathews Leon, and Leena Leon, Vijay Nicole Imprints Pvt. Ltd., 2013. The changes in the fields of Computer Science and IT add up to what is called the information revolution or IT revolution. To survive in this information world one must keep pace with these changes. The objective of this book is to provide an introduction to IT to the readers and enable them to know the importance of computers and IT in business and daily life. The book deals with the fundamental concepts, technologies and theories as well as advanced concepts and practical applications. The book starts with an introduction to computers and telecommunications and then deals with the latest developments and technologies. 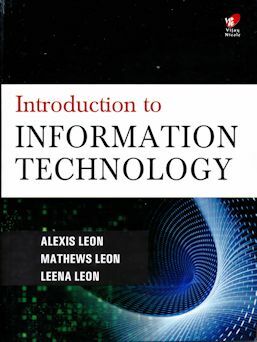 Introduction to Information Technology is written in an easy-to-read and jargon-free style. We have used a lot of images, tables, bulleted lists, etc. to make the reading and comprehension easier, and also to illustrate, familiarize, and demonstrate the capabilities, benefits, and limitations of IT and the related applications. There are a lot of pedagogical features in this book. These include more than 690 review questions (short answer questions, descriptive type questions, and essay questions) and about 740 objective type questions (fill in the blanks, true or false, and multiple choice questions). The answers to the objective questions are given at the end of each chapter. The questions are designed to make your learning easy and effective. There are also 10 solved question papers.